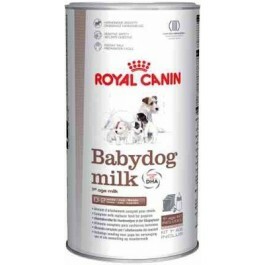 It ontains carefully selected ultra-digestible proteins, and has a lactose content very close to that of maternal milk. It is particularly suitable for the puppy's digestive system, because it does not contain starch, (puppies don’t secrete enough amylase to digest starch). Finally, the addition of Fructo-Oligo-Saccharides (FOS) helps maintain a healthy balance of digestive flora. The puppy’s nervous system continues to develop after birth. DHA Omega-3 naturally present in maternal milk helps develop cognitive function, and so Babydog milk is enriched with DHA.